Last night as my fantasy baseball team’s championship dream crumbled on the TV in front of me there was a glass of beer next to me. It’s the first weeknight, sit-and-chill-and-watch-baseball, casual beer I’ve had in months. And it felt…missed. As I sat there refreshing my Yahoo fantasy sports app I realized just how much I’ve missed beer and writing. I’ve come to realize the two do not have to go hand in hand. In fact, the only correlation between beer and writing for me at the present moment is that beer reminds me of writing and I have this website I used to write about beer on growing digital cobwebs. It felt like it was a good as time as ever to grab the laptop and start punching away at the keys. And before I knew it I had hit the light and passed the heck out. Whoops. That single Starr Hill Oktoberfest Lager did me in. Thankfully the urge still presented itself to me today. So 19 hours later I’m awake and punching keys and will soon hit publish. Back in August I retired shortonbeer.com. It was a nearly two year long project where I wrote and published something just about everyday. Man it was grueling. Man I was over it by the end. But man do I miss having a place to go and just write. Will this become that again? Maybe. We’ll see. This is a good start. I have a super secret project I’m working on that I’m not quite ready to share with the world. I’m still feeling it out and seeing if there are any legs to it or if it’s even possible. If so though I’ll be documenting it somehow, somewhere in some way. It’s good to be back behind the keys. Thanks for reading. If it’s been awhile since you’ve read anything by me, welcome back! If you’re new around here, welcome! Sometimes when it’s late on a Friday or Saturday night and the wife is asleep and Twitter is dull I find myself pondering beer like the good old days of my blogging origins. Each time I get a couple hundred words in and realize I haven’t said anything. This post is worthless. And I don’t even bother to save the Word Doc. Tonight will in all likelihood be no different. Or will it? A rerun of Elementary is playing on the iPad next to me on my desk as the clock on my iMac ticks over to read 12:27 AM. 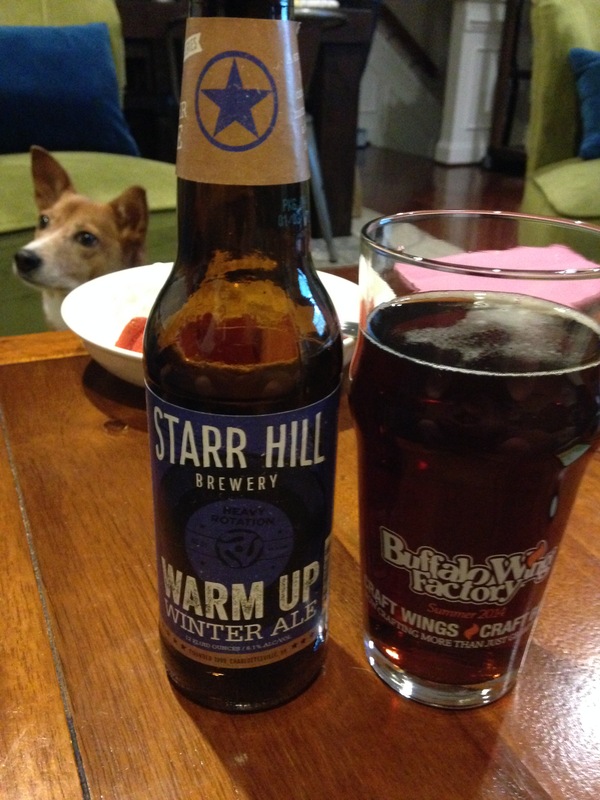 Earlier tonight I drank a Winter Ale called Warm Up by Starr Hill. The kind people at Starr Hill gave it to me along with another beer – a chocolate stout that I haven’t drank yet. Whenever I get these beers I feel obliged to think critically about them, like I used to do all the time when blogging about beer was a regular thing for me. I get excited about beer for a few minutes then, like starting up a car with a dying battery, you believe it’s going to work. It feels right; it makes the right sounds. You know though that the battery is dead. And as you keep trying to turn your key in the starter the noise slowly gets duller and duller with each attempt. I often long for the night I sit here contemplating beer that instead of trying to start up a car with a dead battery that someone brought jumper cables to my rescue. Then I can drive my fictional beer blogging car over to Costco and get a new car battery after waiting in line for 25 minutes since no one ever mans the station at the auto/tire shop. Will it ever happen though? Who knows? Maybe I don’t need jumper cables. That type of re-ignition might be too much to handle diving back into a topic I feel so lost in now. Tonight I drank a Founders KBS. BeerAdvocate ranks it a 100 FWIW. To be honest, I’m not sure if I’ve had it before. I don’t seek out rare beers. If I’m in a new city I’ll check out a bottleshop and see what they have. But you’ll never catch me standing in line for some rare release only at the brewpub where I have to sleep in a tent in the rain in order to get it. I actually didn’t even purchase this KBS. My wife did! While I was at my fantasy baseball auction of all things! She was even able to talk her way into buying two. With these rare/special beers I usually share them. Beer is meant to be shared amongst friends IMO. Drinking with others is always better than drinking alone. Or at least most of the time. I should have shared this one. KBS runs over 12% ABV and I feel it. Whoops. Guess that’s what it takes to get me back writing about beer. That’s all I have for today. More soon hopefully. PS: There’s new stuff everyday on shortonbeer.com. I realized the other day I write in a lot of places. Here, new SOB, EVF, Screenlight, Avid and soon to be maybe more locations. All the while my original site, this one, that’s dedicated to my journey into, through and around [craft] beer gets pushed aside. My bad, y’all. Enough about my writing tendencies; I’m here because I actually have something beer-related to write about. The past two-ish months I’ve had more Bud Light, Coors Light, Miller Lite, MGD and many other light American Lagers/low-grade Pilsners than probably the past three years combined. Don’t ask. It got me thinking that I’ve never really been into Pilsners. And I think like a lot of beer drinkers it took having other styles to actually get into beer. Even today I don’t love Pilsners. They just remind me of college. I picked up a variety case of Victory for $28 from Costco last week. I saw it and thought it was a steal! $1.17 a bottle…Doesn’t get too much better in the craft realm. 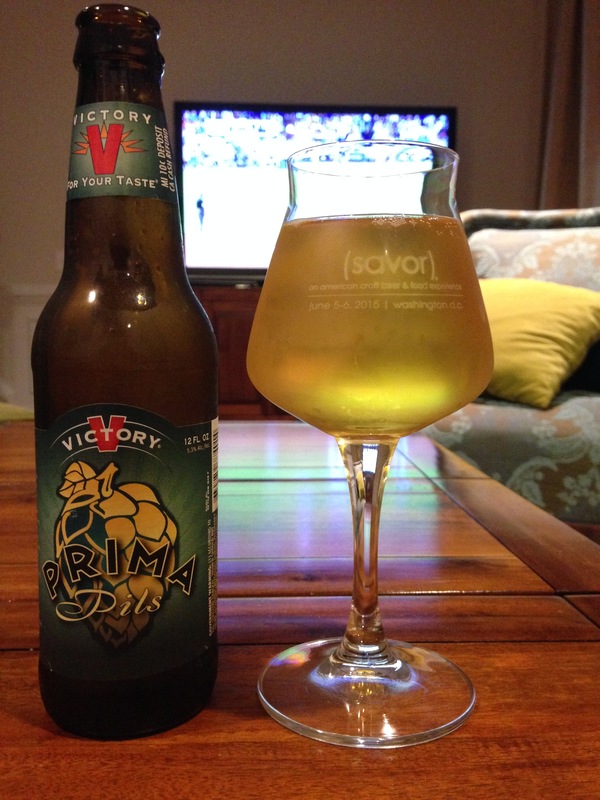 Six of the 24 bottles are Victory’s Prima Pils (the one in the picture above). Prima Pils is a German Pilsner. To my surprise it gets a 91% on BeerAdvocate but only a 3.45 on Untappd. But pretty much everything gets around a 3.5 on Untappd so take that with a grain of salt. To me, it’s a “decent beer.” Yes, hard-hitting analysis on this one. It’s light and if it was a little warmer out I think I’d enjoy it more. IMO, this beer hits the first three bullets almost perfectly. For me and for this bottle, well I don’t really know how to classify “medium-light body.” I’m not really sure how much lighter or thinner this could go. This bottle was not anywhere close to medium, let alone high, carbonation either. So there you go! My not-so hard-hitting analysis on Victory Prima Pils. Give me a break… I’m just getting back into this beer writing thing. Have you had Prima Pils before? Ever been to Victory? Leave me some comments so I don’t lose track of this site! !